623-GFI6302 Features: -GFCI function tests GFI outlets and standard outlets that are wired in series with GFCI outlets. -Over-molded rubber grips. -: 1 in. -Additional Info:GFCI OUTLET TESTERCost is for a min. order of 1/EAUNSPSC:Testing Approvals:. Generic Specifications: -Neon lamps indicate 7 common wiring conditions. 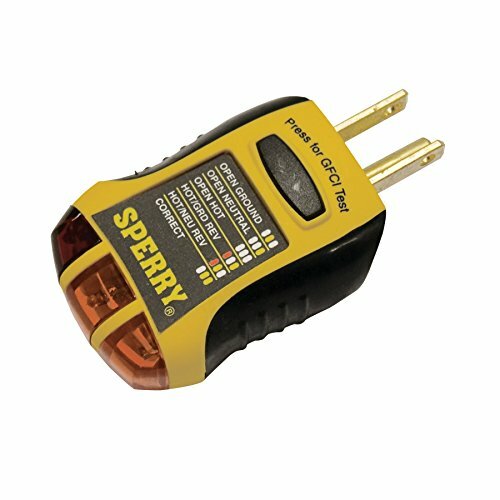 -Voltage: 120.00 V. Dimensions: Overall Length – Side to Side: -3.75 Inches. Overall Height – Top to Bottom: -1 Inches. Overall Depth – Front to Back: -6.75 Inches. Overall Product Weight: -0.16 Pounds.Durable: Hi-Impact Resistant ABS housing with soft over-molded rubber grips. Compact ergonomic design.